I was talking to a friend, who is a local GP, earlier in the year. We were discussing mental health issues that doctors in primary care encountered regularly. It seemed that our GP clinics saw a lot of people struggling with stress in the workplace, a significant many needing time off work to recover. I was also concerned to hear that recovery from occupational/work-related stress was often incomplete and not satisfactory. Due to various reasons, not everyone benefits from the standard psychological treatment provided by NHS services these days. I was keen to do something to help. 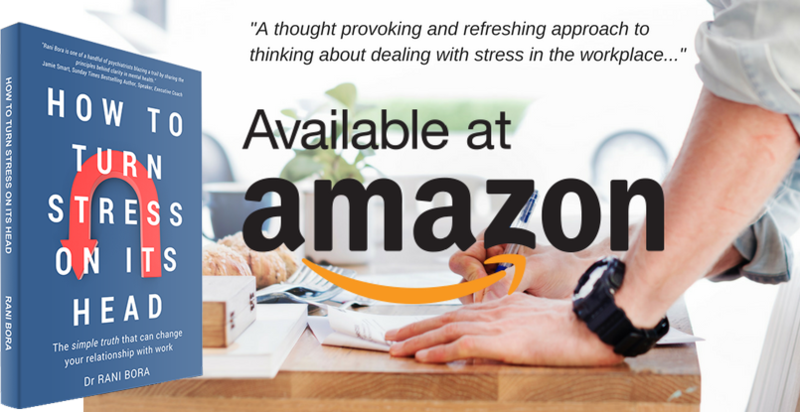 We felt that it would be good to have a book/booklet offering solutions to this stress epidemic in the workplace. And, a seed was sown! I started writing about the principles of innate health and resilience (also understood as The Three Principles of innate health) and how that understanding can help deal with stress and burnout. Initially, it was meant to be a small booklet, but over time this became a short book with personal anecdotes and real-life stories of six individuals who’d been through work-related stress. The plan was to launch the book later this year. A friend reminded me of the theme for this year’s World Mental Health Day (#WMHD2017), on the 10-October, which was mental health in the workplace. So, we decided to bring forward the book launch! For those not familiar with #WMHD2017, the 10th of October is marked as an annual day for global mental health education – to raise awareness of mental health difficulties, look at prevention of mental illness and promote well-being. As I said, the focus this year was ‘mental health in the workplace’. It was heartening to see people and organisations come together for the common good and spread messages of hope. I launched my book with the hope that it can contribute to that collective effort in a small way. If we talk about well-being at work, we have to consider stress at work – an issue that has become so commonplace that we take it for granted. That is despite the massive cost in terms of individual suffering, mental health problems, reduced and lost productivity. According to the UK Health and Safety Executive (HSE), over 11 million days are lost at work a year because of stress at work. So, where do our stressful feelings originate? Where does our experience of the workplace come from? How can we remain resilient in the face of challenging circumstances? Is it possible to be less bothered by people around us? These are some of the questions the book addresses, and the answers may well surprise you. The book explores the one dominant understanding that can transform our relationships and relationship with work itself! The paperback and Kindle Edition are available at Amazon bookstores worldwide.